There are currently 0 users and 238 guests online. EDIT: Game should now be actually playable... Maybe. I keep dying in this if I change directions right after eating a white dot. I can also double back on myself without dying often. Are these bugs? EDIT: I think I've figured it out. 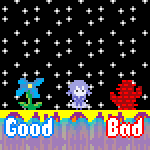 It's related to the tail circle collision detection that starts at score 20, so it's less of a problem as score gets higher. How did you get past 20? How did you get past 20? 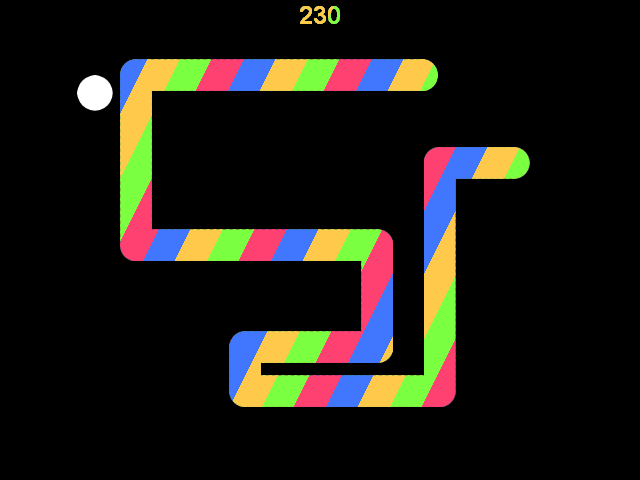 After eating the second white dot, the fruit-snake can't be bent at all. Even if I turn immediately before eating the second dot. In retrospect, I got lucky with three white dots that appeared in a row, and only this allowed me to make it to around 200. It turns out "Always" clycles in construct are framerate dependant (Which is V-synched by default), while the movement of the snake head itself is determined using delta timing. In the way the game was programmed this would cause the "tail" of the snake to, at framerates higher than 40fps, generate closer to the head than intended. I think I fixed it now so it should play as intended on any framerate. It works for me now. Thanks for the fix. Really nice visual design! Helped to make this game feel fresh again.